A junction is the place where two or more roads meet. This is a place where two roads meet in the shape of letter T.
This is a place where two roads meet in the form of letter Y. Two equal roads crossing each other. A place where two or more roads meet, forming a circle that ensures that all traffic must go around in the same direction. Approach on the right-hand lane; keep to that lane in the roundabout and leave by the lane. Use the right turn indicator on approach and through the roundabout. Approach on the right-hand lane; keep on that lane in the roundabout. Use the right turn indicator at the exit before the one to be taken. 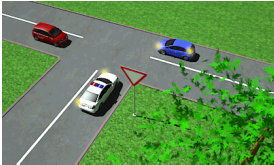 If conditions dictate (fir example, if the right lane is blocked) aproach in the left hand lane, keep to thatlane in the roundabout. You must signal your intention here to turn right. Enter with the left signal on. Approach in the left hand lane; use the left turn indicator before entering the roundabout and maintain this signal while keeping to the left-hand lane. On approaching a round-about, maintain it until you leave the area. When going forward or turning left, always leave the roundabout in the left-hand lane of the exit road, unless conditions dictate the use of right-hand lane. When in a roundabout, look out for vehicles crossing in front of you to leave by the next exit. Give way to traffic on the major road and drive through safely obeying posted signals like STOP or YIELD. Even if you are on the major road, always drive through the intersection as if other vehicles may be crossing or approaching. Hazard lights, also known as Emergency lights or "double trafficators" are not meant to signify going straight or crossing intersection and should not be used as such. They are STRICTLY for emergencies!